Yvonne Melchers (born in Haarlem, The Netherlands) studied at the Rietveld Art Academy in Amsterdam in 1968/1969, but had to leave after only one year on account of too many other obligations. She always continued to draw and paint next to her work in the Academic Hospital in Amsterdam. In 2009 she quit her job and from then on paints full-time. Apart from the one year at the Art Academy and some short courses she is self-taught. Her work is realistic-figurative, with a strong preference for oil paint. Generally using the paint straight from the tube and using mostly bristle brushes she has developed an impasto technique where the brush strokes are clearly visible. For all of her work in oil she uses a very limited palette, the “colours of Monet”, which are five colours besides the whites. Through the years her main themes have been the Dutch coasts with their cool light and the warm Italian life in all it’s aspects. The Rooms with a View are predominantly situated in Italy. Since 2013 she has been working on a series Siena Palio Portraits, which are portraits of modern Italian men and boys who – wearing wigs and historical costumes – take part in the Historical Procession that precedes the Siena Palio (the famous horse race) that takes place twice a year (more information about the Siena Palio can be found on www.ilpalio.org). She has also made a small series of still lifes and every now and then she likes to paint a commissioned portrait or other subject. Since 2001 she has been working in The Netherlands and in Italy (Siena) alternately, and although this caused her some restlesness, she found the contrast in daily life, light and colour inspiring and challenging. From April 2012 she remains in The Netherlands. 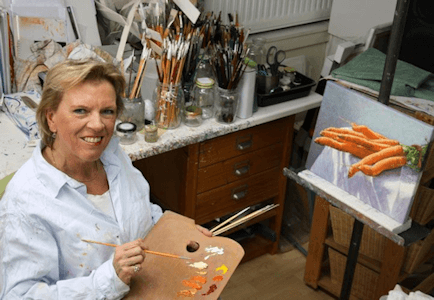 “Yvonne Melchers is a Dutch artist, who paints a wide range of subject matter, including portraits, beachscapes, interiors, and still lifes, using Claude Monet’s limited palette. Although her style is realist, Melchers embellishes her signature paintings by applying impressionist-like brushstrokes that create a sense of dynamic strength. Besides in the Museum Møhlmann her work is/was exhibited at Gallery Lauswolt in Olterterp, Gallery Bonnard in Nuenen, Gallery Staphorsius in Westzaan, Gallery Montulet in The Hague and Gouda, Gallery Pictura in Aijen and Gallery Terbeek in Beetsterzwaag, all in the Netherlands. In 2017 the painting The Shell Seekers/North Sea blues was selected for the second (fysical) round of judging of Figurativas 2017, one of the most prestigious international competitions of contemporary realist/figurative art, organized by the European Museum of Contemporary Art (MEAM) in Barcelona. She was invited by this gallery in Zaragoza / Spain to participate in the anniversary exhibition “20 Años en 20 x 20” on the occasion of the 20th anniversary of ArteLibre. This traveling exhibition, to which 120 of the best realists wordwide are invited, will consist of works of 20 x 20 cm and will be held in Zaragoza, Huesca and the MEAM Museum in Barcelona. 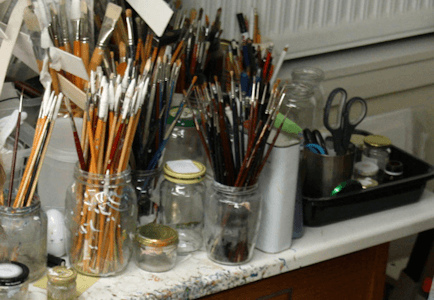 On Facebook she has been made member of the artist groups Poets/Artists, Master Painters and Sculptors of the World (FR), The Representational Art Group (US) and Grandmasters of Fine Art (GB). In the Italian Museum of Contemporary Art (IT) a room dedicated to her work – Sala Yvonne Melchers – has been created.